Attend the 20th Annual Inn to Inn Cookie and Candy Tour hosted by Country Inns in the White Mountains. Participants will tour inns dressed in all their holiday finery offering signature holiday cookies and candies, but will also include a cookbook of the recipes from each inn and a chance to win a $250 gift certificate for a getaway at the inn of your choice. This year the cookbook will also include some of the best of the best. Chosen by editors of New Hampshire Magazine as “The Best Sugar High”. The tour stretches from Harts Location to Eaton, NH, with eleven inns opening their doors to those in search of fabulous holiday treats, recipes and decorating ideas. No inn is more than fifteen minutes from the next, with many much closer. Inns participating in the tour this year include the Darby Field Inn in Albany; Inn at Crystal Lake and Pub in Eaton; Snowvillage Inn in Snowville; Cranmore Inn Bed & Breakfast in North Conway Village; Notchland Inn in Hart's Location; Glen Oaks Inn in Intervale; Inn at Ellis River in Jackson; 1785 Inn, Eastman Inn, and Old Red Inn & Cottages in North Conway, and Admiral Peary Inn Bed & Breakfast in nearby Fryeburg, Maine. Each of these eleven inns on the 20th Annual Inn to Inn Cookie and Candy Tour will feature original holiday cookies and candies, along with exquisite decorations offering tour goers the bonus of taking home holiday decorating ideas as well as scrumptious cookies and candies. The participating inns have developed original recipes for everything from sweet to savory holiday treats, with each inn featuring new recipes for this year's tour, all nestled in a cookbook. To celebratre the 20th anniversary of this "sugar high" the inns will be haveing special events throughout the weekend to include a craft fairs, decorating tips and demonstrations and the Admiral Peary Inn is hosting Mrs. Clause on Saturday. NEW ENGLAND FALL FOLIAGE FORECAST UPDATED. ………………………with too many ideas and supplies and too little time! 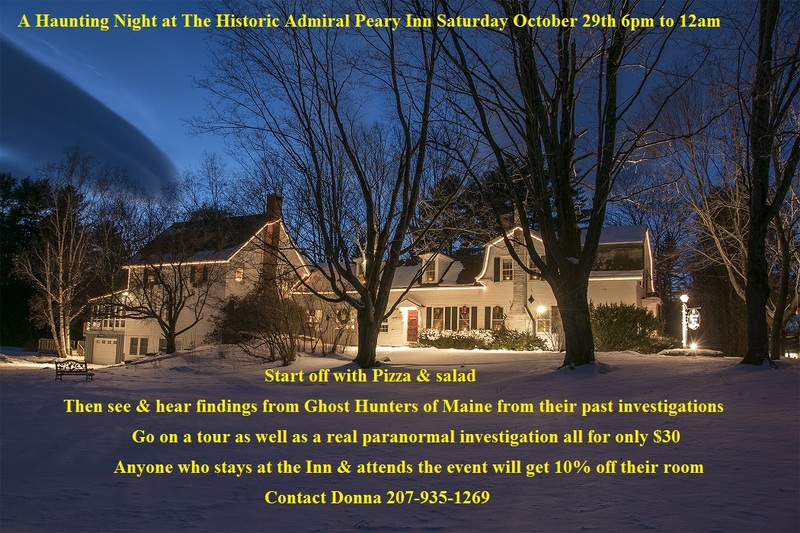 Admiral Peary Inn in Fryeburg, Maine on January 22, 23, 24, 2016. 2 or 3 night get away based on how, many projects you wish to complete. exchange of talent during unlimited hours of creating! and relax after a hectic holiday season. Package Includes: Room with breakfast each morning, coffee and infused water all day, fruit and cookies for snacking, S’more fixins’ for the fireplace, hostess and clean-up duties. (either sharing the bed or sleeping on a comfortable mattress on the floor). Please plan to bring food to share for lunches and dinners, choose to order in or go out one or all of the nights. BYOB and Buffet will be the food service with a convenient bar set with plenty of ice and glasses. I will also heat food items and set the buffet for you. Some equipment and supplies will be provided which will be listed on your confirmation. I will call to co-ordinate food offering, what equipment you may be bringing to share and if you would like to reserve a massage. You will receive a final confirmation from me the evening of January 20th, 2016.
for a reasonable fee of $45/hour. Looking forward to greeting you and getting to know you! If you have others you would like to include do not hesitate to send this to them.